← Previous Post Does Maragaret Atwood Hate Food? Joyce Maynard wrote that tell-all book about him a few years back, which I’ve been meaning to read. 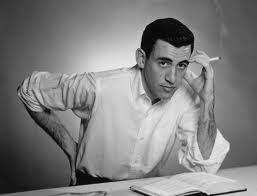 Salinger is one of my favorite authors, I feel bad that he hung it up so soon. I wish he’d keep writing rather than being all reclusive and weird. Susan: It’s a tricky question, but ultimately one up to the artist. There are countless writers and artists whom I’d like to see produce more (and in a few cases, less). But ultimately my desires in this department are solipsistic. Who am I to make such demands? It’s a bit like expecting a baker to make a glorious cake when I walk in the door just as he’s about to turn over the OPEN sign and close up shop. The baker has a life, and his own reasons for keeping his hours. He’ll create majestic cakes on his own time. And I wouldn’t dare encroach upon his right to privacy, or work within the time he allots for himself. I’m a relative stranger. It’s the difference between someone who appreciates and respects art and a fanboy who can never be placated. These tell-all books revealing juicy tidbits seem to violate the artist in much the same way. Conversely, I’m strangely attracted to the information presented. Wish I could wash my hands clean here, but there you have it. But I’m working on it.